Research, collaborate and discover in modern laboratories, comfortable classrooms and lively outdoor spaces. Read about requirements and offerings in the Course Catalog. Cultivate your curiosity by studying life in all its forms—from individual organisms and their communities to the systems, cells and processes that make up living creatures. 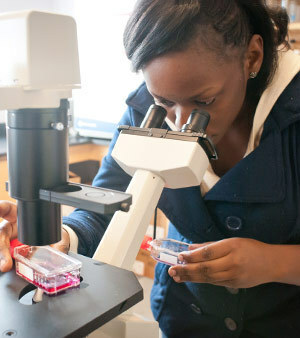 Develop a broad understanding of all areas of biology and learn how to use scientific processes. Explore the concepts of molecular, cell, organismal and ecological biology and apply theory to practice. Conduct cutting-edge research with your professors in the region’s many lakes and rivers, forests and mountain ranges, or get to know the campus’s pond, fields, 86-acre certified tree farm, maple sugar house, permaculture garden and tree nursery. Learn how to brew beer or boil maple syrup in hands-on courses. Combine your classroom and laboratory learning with field studies courses in the Colorado River Basin, the desert Southwest, the island community of Martha’s Vineyard or the White Mountains of New Hampshire. Learn quantitative skills like data analysis to interpret research conducted on campus in the water-quality and ecology laboratories. Communicate your own findings through visual representations and sharpen your scientific writing. Show off four years of learning in your Capstone project and present it to the Eastern New England Biological Conference. Pair the major with Colby-Sawyer’s pre-medical or pre-veterinary track to prepare for the Medical College Admissions Test or entrance into a variety of health-related professional schools. Colby-Sawyer also offers a minor in biology that complements any program of study and will broaden your career opportunities. For complete information about major requirements and course offerings, refer to the college catalog. Spend the day at the Geisel School of Medicine at Dartmouth College where you'll meet faculty, have lunch with current medical students, tour the facilities and attend lectures, including hospital Grand Rounds. The Medical Student for a Day program gives Colby-Sawyer's top performing pre-medical students a glimpse into what it takes for medical school success.